The quality of workwear fabrics depends on how all stages of production starting from manufacturing of yarn for grey cloth up to the finishing. Therefore quality control and enhancement can be accomplished only by setting up of thorough and successful Quality Management System (QMS) which supervises all the manufacturing processes. At the second stage XM Textiles examines the finished products. According to common standards our experts inspect not less than 10% of total order amount. XM Textiles applies “Ten Points” method of fabric quality control which is created on the basis of American system “Four Points”. Current system assigns a certain amount of points to each defect according to its location (warp wise or weft wise) and size. After that we can calculate total amount of points per roll and make a conclusion about its quality. At third stage samples are sent to our laboratory to provide final examination according to ISO standards as well as to confirm the shipment of present order. Under laboratory conditions we test shrinkage, color fastness to washing, wet and dry rubbing, tearing and tensile strength, color matching and PU-coating or WR-finish for fabrics which obtain these characteristics. When impossible to make examination in our laboratory (for example, for color fastness to light or formaldehyde content), samples are inspected in STR and SGS laboratories, which results are accepted worldwide. FIRE RESISTANT TECHNOLOGY THPC-processing for flame-retardant fabrics XM FIRELINE. Our company produces flame retardant fabrics under the brand XM FireLine for the manufacturing of protective and fr clothing. These fabrics are treated with flame retardant THPC in compliance with all technological standards, ensuring a high level of safety of the work wear. The basis of the fabrics treatment process is a chemical THPC C4H12ClO4P (tetra (hydroxymethyl) phosphonium chloride) internationally recognized as one of the best fire retardants for processing cotton and mixed (the CVC) fabrics. The THPC composition treated fabric using a special process. Thus the preparation uniformly coats the fabric fibers and deeply penetrates, being fixed in their structure, whereby the fabric becomes fire resistance property. Flame retardant properties are maintained during long-term storage as well as laundry and dry cleaning. XM FireLine company carefully monitors compliance with all processes requirements, to ensure the high flame retardant proprieties of the fabrics (fabrics are not glowing; the flame does not spread outside the charred area). 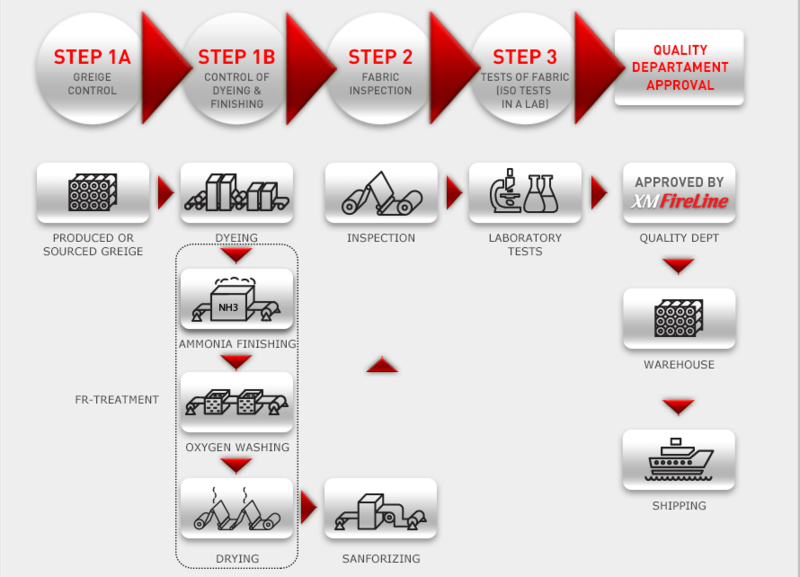 After the stage of fabric dyeing XM FireLine fabrics pass the following stages of the process to make it flame retardant. 1. The fabric is passed through a container with a chemical solution THPC. 2. The fabric is dried on drying machine. 3. Next step, the fabric passes through a sealed tank where ammonia gas under the influence of the polymerization process occurs. 4. The fabric passes through a bath with an oxidizing agent, where the surplus ammonia neutralized. 5. The fabric passes through a series of wash baths, where residues are removed. 6. The fabric final drying stage and it is ready for use. XM FireLine flame retardant fabrics pass a visual inspection and check for the key parameters. Nowadays the flame retardant fabrics are widely used for protective work wear manufacturing around the world. This is due to the fact that the requirements of international standards for the safety of workers become stricter. XM FireLine follows the world trends and every year try to develop new variants of fabrics for protection not only from fire and flame but also from electric arc, static electricity, acids, alkalis and other risks. XM FireLine fabrics recommended for the producing of protective and flame retardant work wear at work associated with short-term exposure to an open flame, heat radiation (metallurgists, firemen), and the possibility of welding sparks and molten metal splash, high heat or electric arc. P.S. Be sure to consult with a technician for the safety of your production, to choose fireproof fabric XM FireLine appropriate level of protection. XM FireLine flame retardant fabrics domestic wash 600C and Industry wash at 750C required. Soft water is recommended. Hard water precipitates soaps and contains calcium and magnesium salts. These can build up on the fiber surfaces, coating the fabric and masking luminescent or FR properties. Do not use natural soaps (anionic or tallow soap). Magnesium and calcium deposits can be removed in a commercial laundry with acetic acid during followed by rinsing with the alkaline neutralization. Do not use chlorine-based bleaches because they are chemically weaken polymeric compounds that provide flame retardant properties of the fabric. ISO 11612:2008 specifies performance requirements for garments made from flexible materials, which are designed to protect the wearer’s body, except the hands, from heat and/or flame. For protection of the wearer’s head and feet, the only items of protective clothing falling within the scope of this International Standard are gaiters, hoods and overboots. However, concerning hoods, requirements for visors and respiratory equipment are not given. ISO 11611:2015 specifies minimum basic safety requirements and test methods for protective clothing including hoods, aprons, sleeves, and gaiters that are designed to protect the wearer’s body including head (hoods) and feet (gaiters) and that are to be worn during welding and allied processes with comparable risks. For the protection of the wearer’s head and feet, this International Standard is only applicable to hoods and gaiters. This International Standard does not cover requirements for feet, hand, face, and/or eye protectors.